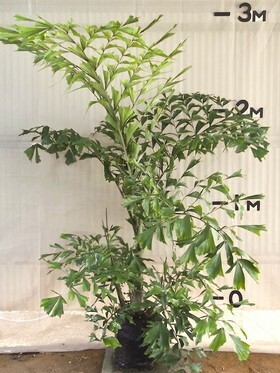 Fishtail Palm - Caryota Mitis This palm's natural habitat is the tropical rainforests from India to South East Asia. Mitis is Latin for gentle or mild. The fishtail is a beautiful palm with a cluster of trunks with leaves coloured tropical green, shaped triangular like fishes tails. It grows to around 8 metres height with up to 4 metres spread on top. Each trunk produces flowers; starting from the top of the trunk and after the last seed head that particular trunk dies, leaving all the other trunks still maintaining the integrity of the plant.